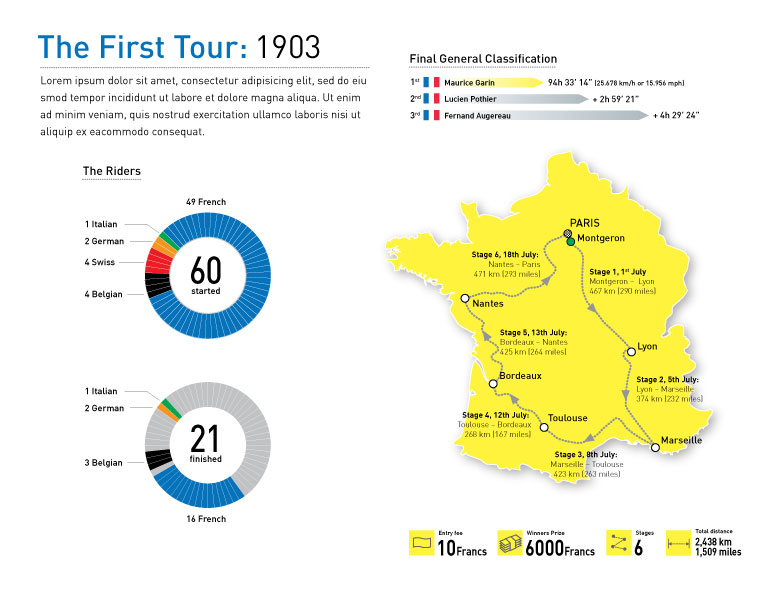 Infographic about the first ever Tour de France staged in 1903. The graphs show the breakdown of starting and finishing riders by nationality. The map provides information on the six epic stages of the race. This is supported by a small graphic showing the General Classification and the time gaps between the top 3 riders. Compared to modern Grand Tours the first tour had relatively few stages, but each was much longer than those raced today. The cyclists did not have to compete in all six stages, although this was necessary to qualify for the general classification. The pre-race favourite, Maurice Garin, won the first stage, and retained the lead throughout. He also won the last two stages, and had a margin of almost three hours over the next cyclist. The circulation of L’Auto increased more than sixfold during and after the race, so the race was considered successful enough to be rerun in 1904, by which time Le Vélo had been forced out of business.